Villa Primavera Royal Park is located in Rue de la Presse, just inside Brussels' Inner Ring Road, in the Upper Town of the historical centre. The residence is at walking distance of Rue de la Loi, the EU quarter, the Grand Place, the Royal Palace, Rue Neuve and Rogier square. 1.2 How to reach the European district ? 1.3 How to reach the business and political centres ? 1.4 How to reach the historical and shopping centres ? European Union insitutions are a short walk away. The EU District is located just across the boulevard (orange metro line on the map) from Madou, Arts & Loi and Trone Metro Stations. Note that the Madou Plaza Tower, home to the EU Commission, is only 100m away. The European Parliament is about 12 minutes walk away. Bus 22 connects all the European Institutions ; the nearest bus stop is Arts & Loi Metro station. Brussels' biggest and newest business district, Espace Nord, running from Rogier Square to the North Train Station area, is just 8 minutes walk away across the Botanic Garden. The newly renovated Finance Tower is a mere 5 minutes walk from the residence. Most major banks in Belgium have their headquarters or Belgian head office within 10 minutes walk from Villa Primavera, including BNP-Paribas-Fortis, Belfius, ING, Delta Lloyd, Deutsche Bank, Cortal Consors, Beobank, Banca Monte Paschi, DHB Bank, and Belgolaise Bank. The French, Swiss, Russian, Australian and US embassies, as well as the French, Italian and Spanish permanent representations to the EU, are about 2 to 4 minutes walk from Villa Primavera. The Grand Place and the famous shopping street Rue Neuve are about 10 minutes walk from the residence. Four bus lines just around the corner of the residence can also bring you there in 5 minutes. Louise Avenue is best accessed by metro (4 stops from Madou station on line 2). 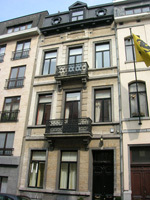 The Royal Park residence is located in the heart of Brussels, just behind the Parliaments of Belgium and Flanders. The district is known as the "Quarter of the Liberties" (Quartier des Libertés) and is one of the best residential areas in the historical centre. Most of the architecture dates from the late 19th century and built in a style reminiscent of Paris. The nearby Congress Column is the tallest of its kind in Belgium - Brussels' equivalent to Nelson' Column on Trafalgar Square in London, or Napoleon's Column on Place Vendôme in Paris. Royal Street (Rue Royale), running from the Royal Palace along the Park of Brussels and the Botanic Garden, is one of the most prestigious streets in the city. This is where you will find Mary's chocolate shop, where President George W. Bush bought his Belgian chocolate on a visit to the European capital. The Royal Circus (Cirque Royal), in the next street from Villa Primavera, is one of Brussels' most celebrated place for high-quality spectacles, concerts and musicals. Many famous British people in history stayed in the Royal Park neighbourhood. Let's cite Lord Byron, who sojourned at 51, Rue Ducale (2 minutes walk from Villa Primavera) in 1816, but also the Duke of Wellington, the Brönte sisters, Sir Walter Scott, or Francis Bacon, just to name a few. It is also in our neighourbood that French writer Victor Hugo lived during most of his years of exile in Brussels. His first son, Charles, was born at the family house on Place des Barricades. There is a supermarket (Carrefour Express), a post office and two banks on Place Madou, 2 minutes walk from Villa Primavera. There are 4 pharmacies in the immediate neighbourhood, two in Rue de la Croix de Fer, one in Rue du Congrès, and one in Rue des Cultes. The nearest car rental agencies are Europcar and Avis, which both have a branch at the South Station (Gare du Midi). To get there, take metro line 2 from Madou station (about 5 min). One of Brussels' best fitness club, Aspria (including swimming pool, sauna, massages, yoga, aerobics...), is located 700m from Villa Primavera. There are also three Health City within 1km. Our recommendations are in bold.